This is Kevin's 40th year in the wine business, so let's pop a cork and toast America's very best, most popular wine course which has been fully updated with loads of new stuff. Acids are extremely important structural components of wine. If a wine is too low in acid, it tastes flat and dull and lacks structure, and if a wine is too high in acid, it tastes bitter and sour. Under most circumstances, the winemaker can manipulate the acidity. However, it is the grape grower who can really assist in ensuring that the grapes are harvested at their optimum acid/sugar balance. I know this can be difficult trying to ripen grapes if the weather is continually inclement. Grapes grown in warmer climates have lower acidity than grapes grown in cooler climates. When a wine label states the total acidity is 0.60%, what does it mean? It means there are 0.60 grams of acid in every 100 ml and the pH is 3.5? Tartaric acid and potassium hydrogen tartrate are the predominant acids in wine. Since potassium hydrogen tartrate and potassium hydrogen malate are derivatives of tartaric and malic acids, respectively, only tartaric and malic acids will be discussed with the understanding that their derivatives are also present in wine. The relative amounts of tartaric and malic acids vary depending on the grape variety and on where the grapes are grown. For example, a Chardonnay grown in Burgundy has a lower concentration of malic acid than a Chardonnay grown in the Napa Valley of California. This is the most important acid in wine due to its role in maintaining the chemical stability of the wine and its color. It also influences the taste of the finished wine. It may be most recognizable to wine drinkers as the source of "wine diamonds", the small potassium bitartrate crystals that sometimes form spontaneously on the cork. These "tartrates" are harmless yet unsightly, despite sometimes being mistaken for broken glass, and are prevented in many wines through cold stabilization. The tartrates that remain on the inside of aging barrels were at one time a major industrial source of potassium bitartrate. It is important to note that tartaric acid plays a vital role chemically, lowering the pH of fermenting "must" to a level where many undesirable spoilage bacteria are unable to live, and acting as a preservative after fermentation. 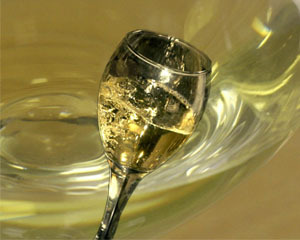 In the mouth, tartaric acid provides some of the tartness in the wine, although citric and malic acids also play a role. This is a by product of winemaking, and is the potassium acid salt of tartaric acid. You may be familiar with it in the kitchen where it is known as cream of tartar. Potassium bitartrate (KHTa) crystallizes in wine vessels during the fermentation process of must, they can then precipitate out of the wine when in bottles. The crystals - aka. tartrates or wine diamonds - will often form on the underside of a cork in wine bottles that have been stored at temperatures lower than 10°C (50°F), and will seldom, if ever, dissolve naturally into the wine. Because of the extra time red wines spend in oak which are often exposed to colder winter temperatures, this sees most of the tartrates being deposited out in the oak barrels. This in turn results in bottles of red wine being much less susceptible to KHTa deposits. Whereas white wines tend to bottled sooner, so the deposits haven't had time or cold temperatures to settle out, meaning that public acceptance of the harmless, unsightly crystals is naturally lower. Potassium acid tartrate, also known as potassium hydrogen tartrate, is used as a primary reference standard for a pH buffer. Using an excess of the salt in water, a saturated solution is created with a pH of 3.557 at 25°C. Upon dissolution in water, potassium bitartrate will dissociate into acid tartrate, tartrate, and potassium ions. Thus, a saturated solution creates a buffer with standard pH. Malic acid is an organic compound and is a dicarboxylic acid which is made by all living organisms. It contributes to the sour taste of fruits, and is also used as a food additive. The salts and esters of malic acid are known as malates. The malate anion is an intermediate in the citric acid cycle. Malic acid is present in grapes and in most wines with concentrations sometimes as high as 5 g/l. It gives a tart taste to wine, although the amount decreases the more the fruit ripens. The process of malolactic fermentation converts malic acid to much softer lactic acid. Along with the main tartaric and malic acids, citric acid plays a role in winemaking as a minor acid. Oxalic acid, found in rhubarb as well as grapes, is another natural acid. The main fermentation acids, such as lactic, succinic and acetic acids have milder, more complex tastes. There is no question that acids not only contribute tartness to wine but also flavor, and in my opinion their greatest role is an ability to slow down the growth of harmful microorganisms that would otherwise spoil the wine. Tartaric acid is found in virtually no other fruit apart from the grape, and here it is the major acid. With its potassium and calcium salts, it largely controls the effective acidity or pH of such wines. It not only contributes to the color and taste of a wine, but also to its resistance to microbial attack. Should a wine be deficient in tartaric acid, it is highly likely the wine will have certain problems. Malic acid, unlike tartaric, is widespread among the many fruits and vegetables from which wines are made. In hotter climates less malic acid remains in the ripened fruit than in cooler climates, but in both climates malic decreases as the fruit ripens. Too much malic tends to give a harsh, greenish taste, so reducing it is often a major consideration in softening an overly acidic must. One way to do this is to subject it to fermentation, as 20-30% of the harvested malic is respired during fermentation. If the fermented wine still contains too much malic, a malolactic fermentation can be encouraged whereby the harsh malic acid is converted to the softer, milky lactic acid. Some lactic acid is produced during ordinary fermentation, but malolactic fermentation (MLF) can reduce malic and increase lactic by a factor of five. Lactic acid, while milder in taste than malic, can be a double edged sword. On the one hand its mild sour taste counteracts the harsher tartness of malic, but on the other hand it can invite infection by certain lactic bacteria that produce odors reminiscent of sour milk. Citric acid, being a minor acid in grapes, is often added to wines to increase acidity and complement specific flavors. In the grape, citric acid all but disappears during fermentation in much the same way that malic is reduced. It is reduced through normal fermentation and again during MLF. If citric is added to an almost finished wine to increase acidity,it gives the wine a freshness of flavor that is unreal - and it is!. Acetic acid is a natural component of most wines and is volatile and odorous, smelling of vinegar. As wine is exposed to the air, acetic acid is formed quickly by certain bacteria which will threaten and spoil the wine by oxidizing the ethanol (alcohol), producing volatile acetic acid (ethanoic acid) and ethyl acetate (ethyl ethanoate). Poorly stored empty barrels are a common source of the bacteria, as are mouldy grapes. Outside the wine world, this is exactly what's needed to produce wine vinegar. Simple acid testing kits that measure acidity by titration are available from any good home winemaking store. Titration is the process of determining the concentration of an acid in solution (in wine) by adding to it a standard reagent of known concentration in carefully calibrated amounts until a reaction of definite and known proportion is completed, as shown by a change of color, and then calculating the unknown concentration. For most kits, you would add a 15cc sample of must or wine to a clear sample bottle or flask. Next fill a 10cc syringe with a titrate solution (usually sodium hydroxide). The titrate solution is then added ¹/2cc at a time to the sample and shaken. At some point a color change will occur - pink for white wines, gray for red. The amount of titrate solution used is the key to titratable acidity (TA) of the wine. Each cc of solution represents 0.1% TA. Thus, if 5¹/2cc of solution were used to produce the indicated color change, the TA of the wine or must equals 0.55%. Testing is straight forward and effective - you don't have to be a chemist. When testing red must or wine, noticing the color change can be a bit harder when titrating with a simple kit. A wine that is too high in acid will have a harsh tart or acidic taste. If the acid level is too low, the wine will taste flat and bland. Use this Acid Testing Kit to test the acid level of your must, then adjust accordingly. This kit comes complete with test vial, syringe, color solution, sodium hydroxide and detailed instructions. Malolactic fermentation is a method for reducing total titratable acidity by adjusting the relative concentrations of L-malic and L-lactic acids, softening the wine and allowing it to develop mellowness and full-bodiedness. This process also results in enhanced microbial stability since one of the key nutrients of spoilage bacteria is removed. The Malic Acid Kit has a range of 30 - 500 mg/l. 10 tests per kit. The goal of this kit is to provide the home and professional winemaker with a high resolution test for determining the Total Acidity content in wine. This allows accurate acid additions to be made or guide acid reduction techniques. The Acid Titration Kit for Testing Total Acidity (TA) removes the guess work of color indicators to identify your titration test end point. By using a stir plate and pH meter to identify your titration end point (just like professional wineries) you can accurately calculate your Total Acidity, giving you the power to guide your fermentation, aging, and bottling goals. This very accurate kit is easy to use and will fit seamlessly into any home winery, empowering you to take your wine to the next level. By combining the whole Master Vintner Advanced Wine Analysis Kits line, the vast selection of wine additives, you can turn any home into a chateau. NB: We recommend diluting the .2N NaOH to .1N by mixing 50ml of NaOH with 50ml of distilled water, this will give you more control and ease of use with the test. The D-Lactic Acid test kit is designed to measure D-Lactic Acid concentration, an important indicator of excess or unwanted growth of lactic acid bacteria. When winemaking is well controlled, these bacteria play and important role in improving wine quality, but when growth occurs at the wrong time or of the wrong species, wine quality and acceptability are greatly decreased. Regular monitoring can help prevent the development of lactic taint, biogenic amines, and bitter, "mousy," or "ropey" wines. The D-Lactic Acid kit has a range of 30 - 500 mg/L, equivalent to a range of 120 - 2000 mg/L with diluted samples. 10 tests per kit.